View upriver to Wrightsville from Turkey Hill gets my vote as the best of many great Susquehanna River views that are accessible only by foot. This viewpoint is reached from the Turkey Hill Trail, which is a footpath that parallels the multi-use Enola rail trail for three and a half miles of its northern-most segment. 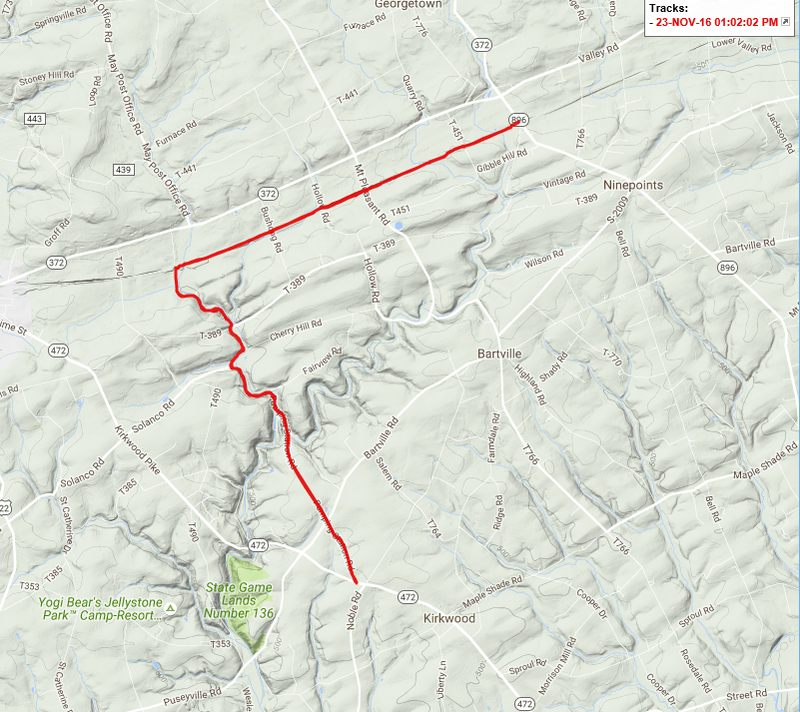 The Enola Low Grade Rail Trail is thirty miles long. 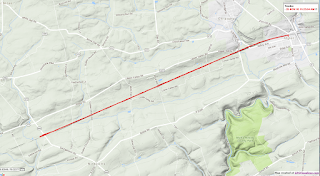 It is named for the very gently sloped rail line designed to transport heavy freight across this rolling country with a slope (grade) everywhere less than one percent. It runs through half a dozen townships in Lancaster County PA from the Susquehanna River east to the borough of Atglen. 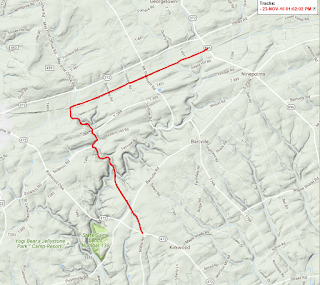 Each township is in charge of developing and maintaining its section of the trail. There is no central authority. Some of the townships have fully developed their length of trail, with fine packed gravel surface and fully developed trailheads. In other townships the trail is just a weedy muddy track where nothing has been done since they ripped out the rails and ties back in the late 80's. A summary might go like this: Low grades for the east, high grades for the west. But it's not really that simple. The east end of the trail has a setting that is wonderfully distinctive. 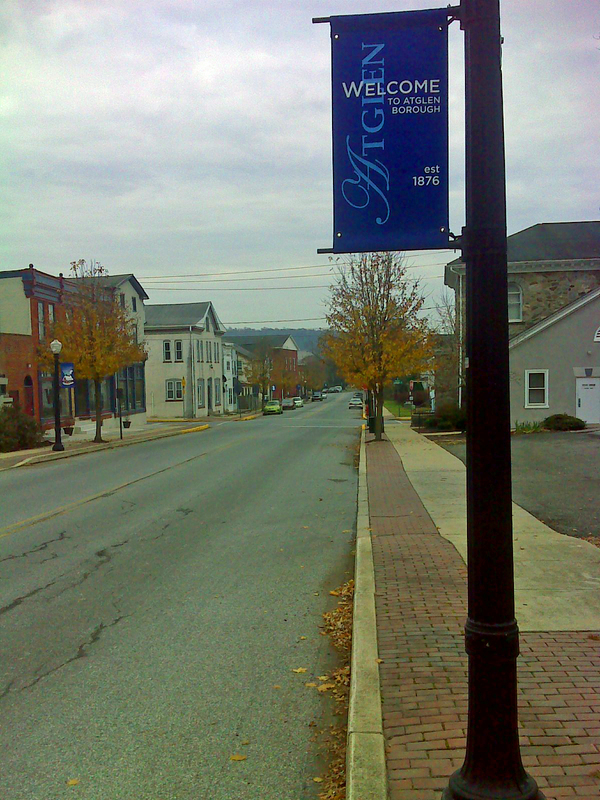 It runs through the very heart of rural Lancaster County - gently rolling, rich soil, well drained but moist - perfect for farming. 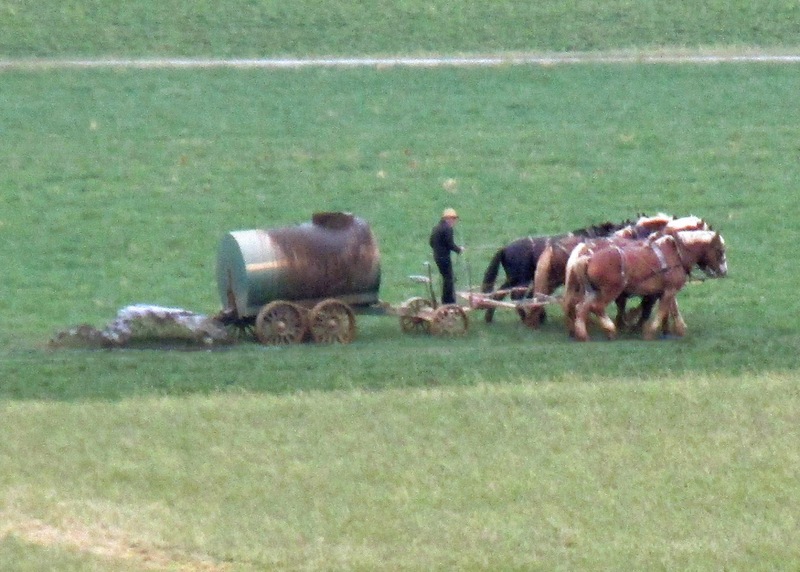 Here, along the trail, virtually every farm is Amish owned. Well kept boxy homes with no power lines, neat, clean barns and outbuildings, clotheslines strung on a pulley rope from house to high on the side of a barn or to the top of a pole. Beside the barns sit tractors with big steel wheels, never taken to the fields. I saw two little boys in blue shirts, black pants with suspenders, flat brimmed straw hats climbing on the fence of a brown-egg-laying chicken's pen. 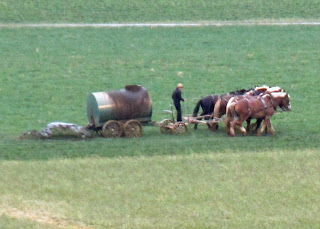 Every farm has well tended vegetable gardens, dairy cattle browsing the fields, and of course the boxy gray-painted Lancaster County settlement's horse-drawn buggies going to and fro, hauling kids to the one-room Amish schools or parked at a local hardware and feed store. It's an idyllic setting, but the trail through here is not ready for prime time. In contrast, the western part of this trail runs along the Susquehanna River. To maintain the gentle grade they blasted its steep sided bluffs. 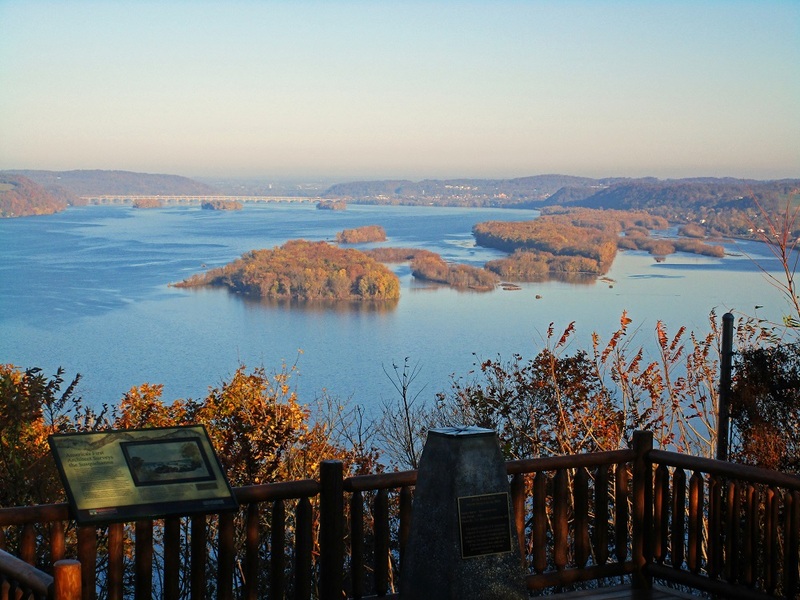 The views are at times spectacular, and there are designated rock climbing areas that show signs of frequent use. But this section of trail is severed by a significant gap. 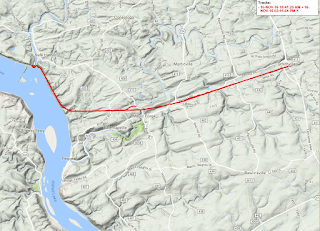 The long high trestle over the Conestoga River beside Safe Harbor Dam has not yet been opened. I hiked this unique trail in five day hikes. The two western hikes covered the two sections along the river, separated by the off-limits trestle bridge. A smaller but still impressive trestle over Pequea Creek has recently been reconstructed. 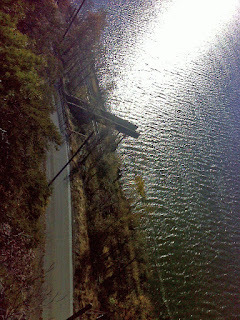 I already showed you this trestle from below, as seen from the Conestoga Trail. Now here's the perspective from the Enola Rail trail. 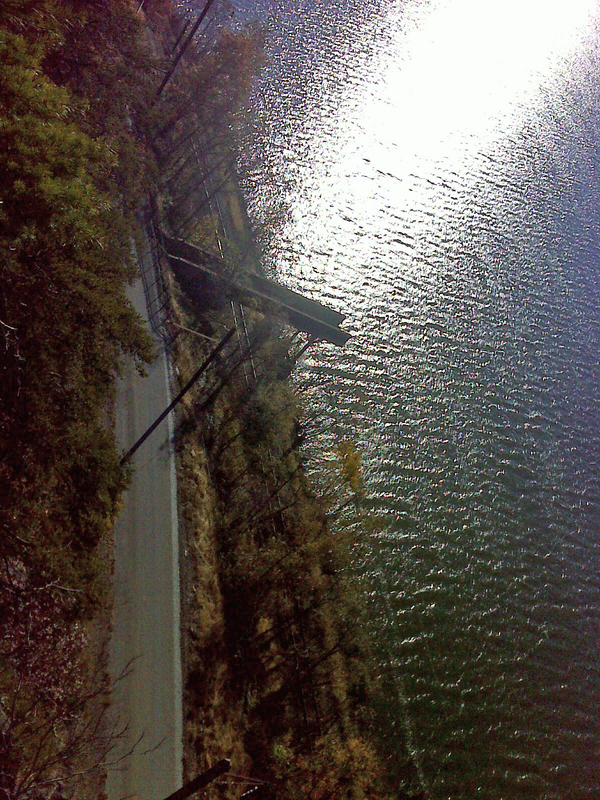 From this trestle west is where you'll find the breathtaking scenery. 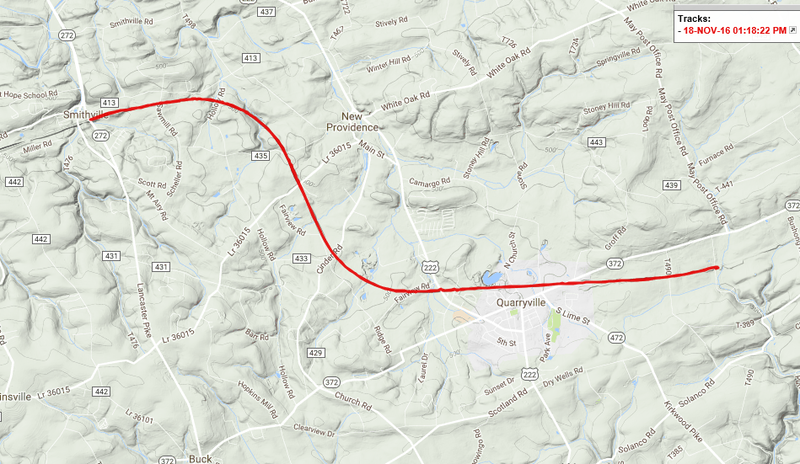 My three day hikes in the east were rural and quaint, as described, except where the trail passes through the town of Quarryville and where it merges with the active Amtrak rail line and peters out, becoming weedy and unused as it approaches the planned eastern trailhead in Atglen. 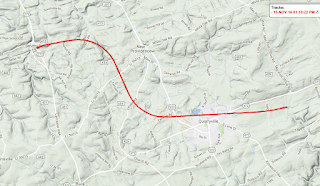 Now, since I was doing out-and-back day hikes, I had the chance to do a loop hike that included the Turkey Hill Trail, which climbs high above the Enola Rail Trail and roughly parallels it for three and a half miles. Apart from the Turkey Hill viewpoint featured in the headline photo, the trail passes two giant windmills. On the other side of this hill is the Turkey Hill dairy's manufacturing plant, and, enigmatically, between the creamery and the windmills is a huge active landfill. On the day I passed, there was a breeze coming off the dump. Not pleasant. Fortunately the stench lasted only half a mile. Near the south end of the Turkey Hill Trail are two more spectacular, even scary cliff-top views. The drop from this latter viewpoint was so sheer, and the exposure so treacherous from the jagged rock that I was afraid to stand. I crawled out on the most out-jutting rock on my belly, like a snake, and reached my camera out to get this shot straight down. For perspective here is how that frightening viewpoint looks from directly beneath it on the Enola Trail. The odd sluice-like structure in the view from above carries the runoff from a stream, and bridges over the lower railroad track, which is still in use. There were three such structures along the trail. Here's a look at another one, where Mann's Run drains into the river. Mann's Run was a pretty spot, showcasing some lingering fall color. 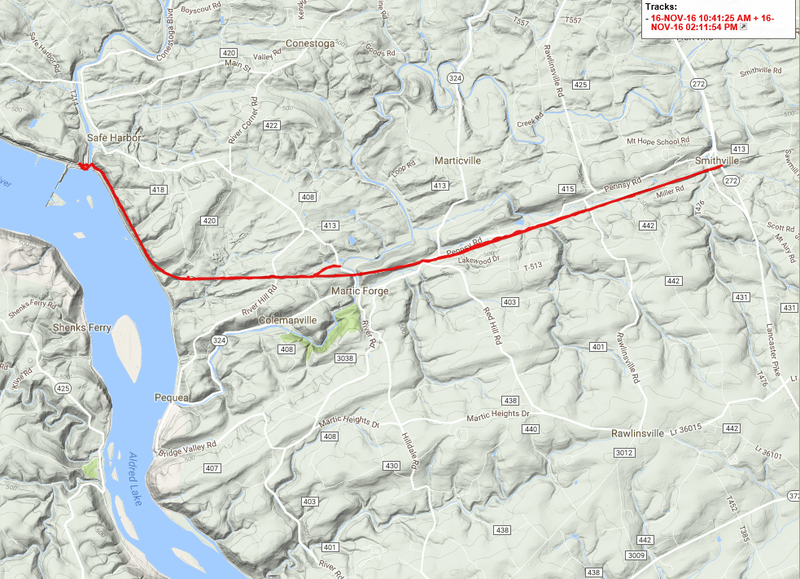 Finally, here are the five GPS track maps of this trail, in geographic order from west to east. 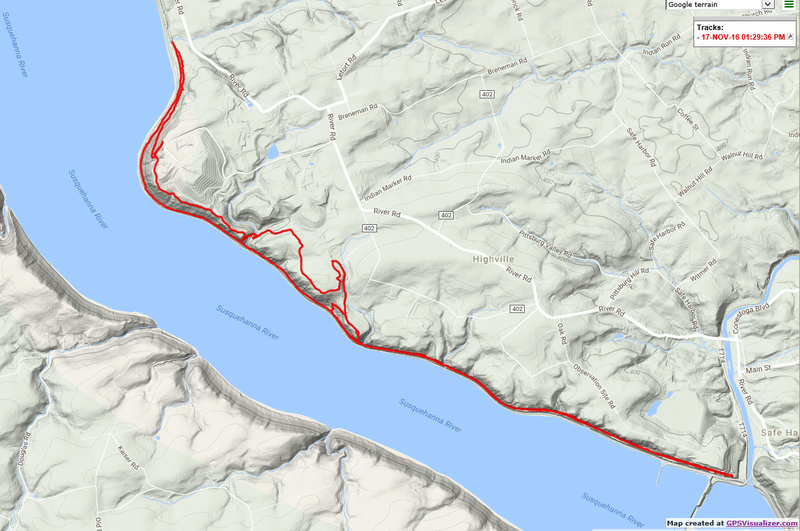 If you want to do just one of these five hikes, beyond question the best is the Turkey Hill/Enola loop hike from the huge paved Turkey Hill Trailhead, the first of the five maps below. 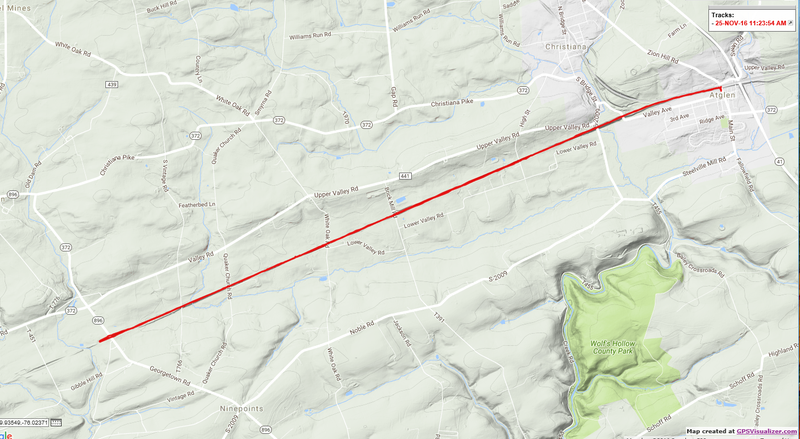 The little 'tail' in the middle of this track is the connecting road from the Conestoga Trail route to a nice trailhead parking area on the Enola Trail. It's just a quarter mile between the two.